A full complement of eight RS800ss turned up on a bright Saturday autumnal morning, to rig up and get ready for a full day’s coaching with Will Crocker. Assembling in the cosy top bar the group had a very interesting briefing from Will, about boat speed and how he and his helm, Roger Phillips, shared the relative workloads between them upwind and down. It was particularly interesting and different to have Will’s perspective as a top crew compared with other coaches who are generally helms. Then it was on to the water to practice the new upwind approach and communication skills in the sunny but rather perky and very gusty South-Westerly breeze. The combination of Grafham’s gusty conditions with newish boats, crews and boom sheeting trials made for regular swims for most crews. However, a demonstration by Will from the coaching RIB of the level of crew communication of gusts and lulls to their helms, while also encouraging the crew to work harder in responding to changing conditions, meant that all (especially the crews) returned tired to the shore. Nevertheless all were full of enthusiasm for an afternoon session and working on building trust between helms and crews. 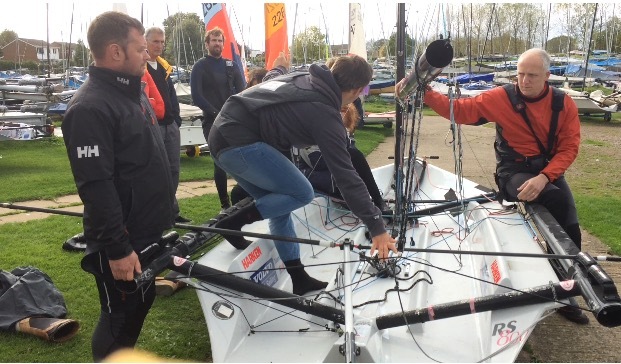 After a welcome lunch to refuel, people voted for a short shore-based session to get the basics of crossing the boat in tacks and gybes right. After that there was time for the crews return to the water for a shorter afternoon session to practice downwind speed and turning the corners. And also for some more time to inspect their foils. Back on shore after a full day the crews warmed up with tea and cake. All agreed they had learnt a huge amount, improving across the day and plenty to work on for the future. After a final vote of thanks to our coach Will for an excellent day, crews dispersed to wash off any killer shrimps lurking on their boats or trailers before heading home, with the crews especially tired I suspect!